Concrete has been used in construction for literal millennia. It is the reason for the survival of so many historical structures to this day. However, if not appropriately protected concrete will deteriorate when exposed to harsh environments, like industrial and coastal areas, or areas with extreme weather variations. The reasons for coating concrete can be anything from protection to aesthetics and there is a concrete coating for each application. In this article we will take a look at the various coating options for concrete, the appropriate paint products, and where to find suppliers and contractors in the US. Whether you need concrete paint for interior and exterior walls, driveways, balconies, factory or garage floors, we’ve got you covered. Particular needs of the structure – do you need waterproofing, chemical resistance, or is it aesthetic? Required lifetime of the system – what conditions will the coating need to withstand, and for how long? Pre-treatment and surface preparation – whether cleaning, acid etching, or repairing, different coatings will require slightly different degrees of preparation. Environmental impact – low VOCs, no VOCs, region-specific regulations, encapsulation, and containment, all these factors need considering. Location of the structure and accessibility restrictions – for example, polyurea application requires special spray equipment, and other coatings require warmer temperatures to cure. Application method – this again is a coating specific requirement. Not all paints are suitable for all environments. Some coatings are simply underqualified for the job if applied in the wrong places. By the same token, some coatings are overqualified. A heavy duty industrial polyurea would be entirely inappropriate for domestic use or a home garage. One of the key reasons for coating concrete is its porous nature. Left unprotected concrete can absorb water, salts, acids, and other substances to which it is exposed, and deteriorate. If there is reinforcing steel within the concrete, these elements can lead to corrosion and failure. The job of the concrete paint in this case is to seal and protect the concrete from water, weather, chemicals, and other harmful factors the environment may contain. 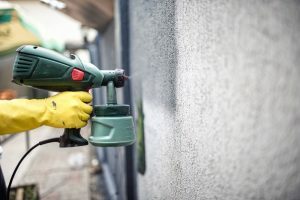 But concrete coating may also be used to beautify a substrate, to create an easy-to-clean surface, or to brighten up a warehouse or factory and improve safety. The different types of basic concrete coatings are polyurethane, epoxy and polyurea. Applying polyurethane concrete coating with a spray gun. Properties: UV stability, durable, water resistant, chemical resistant, abrasion resistant, flexible, hygienic, easy to maintain, range of colours and finishes. Uses: Warehouse, hospital, storage floors and more, exterior finish for balconies, patios, pool surrounds, car parks, use as a UV stable topcoat over an epoxy paint. A two component coating, polyurethane is often used for external applications or in environments with a high UV exposure where epoxy does not work. It provides protection against medium to high foot traffic and high wear situations, and is a flexible concrete coating solution. Water-based, solvent-based, and 100% solids varieties are available. Less common in industrial setting than epoxy paints because they have weaker impact and chemical resistance. Properties: Hard-wearing, water resistant, chemical resistant, abrasion resistant, heavy duty, durable, hygienic, easy to maintain, range of colours and finishes. Uses: Workshop, garage, warehouse, and showroom floors, schools, prisons, hospitals, car parks, cold storage. 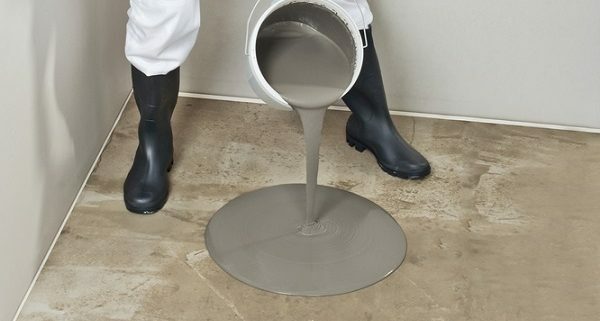 Usually a two component coating, epoxy paints are the go-to flooring paint for factories and industrial facilities, in fact they are the most common concrete floor coating in North America. They come in solvent- and water-based varieties, as well as 100% solids, and anti slip additives and aggregates can be added for a non slip finish. The downside to an epoxy paint is that is not UV stable, and will chalk and fade in sunlight. Epoxy is also available as a self-levelling paint. Properties:Waterproof, chemical resistant, abrasion resistant, no VOCs, UV stability, fast return to service, thermal resistant, flexible. Uses: Secondary containment, bridges, tank coatings, car park decks, waterproofing membranes, foundations. The relative “new kid on the block”, polyurea has made a name for itself due to its outstanding physical properties. It is a hot spray applied coating with a dry time of only seconds, meaning there is a very short return-to-service time. Polyurea provides a monolithic, waterproof coating which can also cure at low temperatures. The other benefit of polyurea is its flexibility and tensile strength; polyurea can stretch with a substrate without damaging, unlike the other traditional coatings. 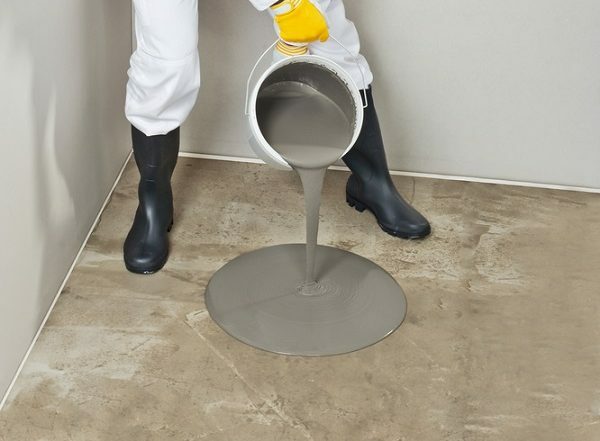 Concrete coating can be formulated to give it anti slip or antimicrobial properties. In healthcare and food preparation industries an antimicrobial coating is often regulated. For anti slip properties, an aggregate can be added (not to all paint, always read the specifications), or choose a concrete paint with an anti slip profile. Environment and use are two of the most important aspects of a coating choice. For example, a balcony coating needs to be UV and weather resistant, a driveway coatings needs to be oil resistant and suitable for traffic. The concrete substrate needs to be free of moisture. Damp concrete will affect coating adhesion and lead to a coating failure. Concrete paint works best as a coating system. This means for premium results it can include up to five layers, for example – a primer, a sealer, undercoat(s), topcoat(s), and a final sealer. The concrete substrate needs to be cured, free from defects, dry, and clean – no contaminants such as oil, algae growth, loose particles. The concrete substrate needs to be sufficiently porous for good adhesion – smooth concrete may require extra preparation such as acid etching or sandblasting. There are many brands and companies that provide concrete paint for consumers and companies in the US. In the table below is a representative selection of products, as well as an indication of price. For the best results from a coating, we recommend hiring a trained professional. Applicators for industrial concrete coatings operate across the US. If you would like more information, or have a project which needs concrete paint, our experts are here to help. Just get in touch through the “Request a quote” button and let us, in cooperation with our coating partners, connect you with the best coating solution for your needs.